Govt Bugs Mrs Rawlings' Phone ? 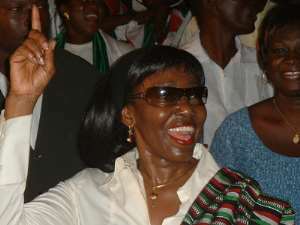 The former first lady of the Republic of Ghana, Nana Konadu Agyemang Rawlings has lamented that the phone lines of her family and other leading members of the opposition NDC has been bugged by President John Agyekum Kufour's government. She stated this during a live interview with Radio Gold's James Agyenim Boateng on Tuesday. Mrs Rawlings who sounded disturbed claimed she became aware of this through a member of the Jewish company which sold the bugging machines to the government. She said the person who she claimed was her late father's friend disclosed this to her that the company would have sold the device to the NDC government but her husband, the former president did not like the idea. Asked if she has any proof to substantiate the allegation, the former first lady maintained that she is privileged to information which according to her was confirmed by Mr Kweku Baako whom she described as President Kufour and NPP's Darling boy, when Mr Baako went on air and claimed he had the ability to tap the telephone message of some people. Among other things, Mrs. Rawlings accused the Kufour administration vis-à-vis by some members of the media. She said the media is bent on destroying the good name of her family and other people who have achieved something good for the country. She stated that she and her husband are living under 'silent harassment' and added that the media for their own parochial interest is maligning her husband, Mr Rawlings. On recent allegations about the involvement of the 31st December Movement, an NGO owned by her, in projects of which the NDC government had sourced loans for Nana Konadu denounced that the NGO had nothing to do with the NDC but have had to co-operate with the government of the day. She accused the NPP of curtailing most of the projects of the NGO hence it looks like they are no more effective. The former first lady was asked by the host as to how she feels when the media publish negative things about Mr Rawlings, and in her reaction said “how do I feel happy when false accusations are being labeled against my husbands”. When asked if she would suggest to Mr Rawlings to keep mute to avoid to much media coverage, she said her husband could not keep silent when there is so much harassment and fear in the people and nobody seems to be talking about them.